The latest issue of Santa Rosa Magazine, published by the Press Democrat, focuses on the many threads and relationships that connect a community. Throughout the issue, influential people from the world of sports, food, arts, philanthropy, technology, public safety and architecture were asked to talk about the people they admire most. The result is a fascinating look at the invisible threads that connect us all. 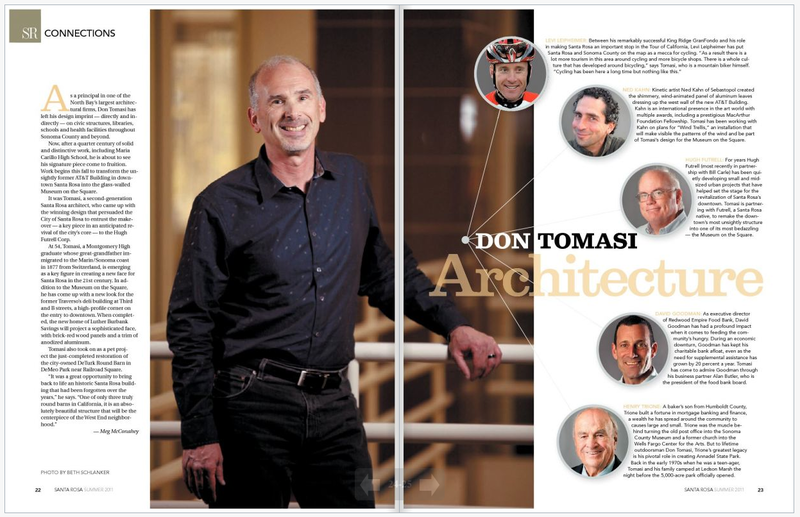 Don Tomasi of TLCD Architecture is featured in the issue on pages 24-25 (online version), where he talks about the people who have directly and indirectly influenced him, and who contribute to a vibrant and rich community life. This is a must read for anyone who lives, works and feels their own sense of connection to Santa Rosa.